Adding Green Ale on Buying vend list would be nice. The drop rate of the gold coins seems to have been severely reduced during the emergency maintenance. Edited by Exuro, 13 March 2015 - 12:44 AM. From my understanding, silver coins can be traded in for Green Ale (currently). Campitor has mentioned they'll add a converter NPC next Wednesday so that we can also turn in the other coins. So... on the Classic server, I collected the 30 shredded evidences, went looking for ORiely, and found him on the ship. I should have known better, seeing as how everyone *loves* MVPs, and that a level 77 with crap gear is expected to be able to kill even an event MVP, but after blowing through about 30 whites just trying to hit him, I ran from Snake Lord. I alt+tabbed to look up info because I was curious why I couldn't hit it. Surely the GMs wouldn't put in an MVP that's immune to neutral property... and I was wrong. I alt+tab back to find myself dead. I respawned, got my only ele weapon (+7 ice falchion I was lucky to find on sale cheap a while back) and headed back. You don't need to kill it to finish the quest, i remember back in valkyrie server there was a ton of ESL's spawning due to the number of ppl talking to the final npc, barely made it out alive while spamming the npc lol. Fun times! It has begun!!! I'll be heading there later after work to clean up! The Snakepentors are duplicates of Evil Snake Lord, which are weaker than the original but can still easily kill even high-level characters. You don't need to kill a Snakepentor to complete the quest. If O'Riley is not on the ship, walk along the gangplank and he will reappear. But yeah i understand, cant really walk along the gangplank when its full of ESL's! Hey guys, we should form a group and talk to O'Reiley all at the same time! It should be an event in itself. Can't find the ESLs. It's as if they're teleporting to a random location on the map that's inaccessible. How about upping the bot patrols in the event areas instead of punishing the real players? There were three Snakepentors when I finished talking to O'Reilly. One was already there, one spawned after I talked with the NPC, and the third from another player who talked to O'Reilly. Good thing you don't need to kill them to finish the quest. Thanks for fixing the quest (on Renewal)! if you think about it, you are leaving o'reilly to die a horrible death at the hands of snakepentor if you just bwing after collecting your reward. in the end, the bad guys always win! O'Reilly actually leaves first after you get the reward and leaves you to your death at the hands of snakepentor... I died too, actually, lol. but he always comes back! After further investigation it looks like only the ISIS mobs drop the gold coins now. Please verify if this was intended? 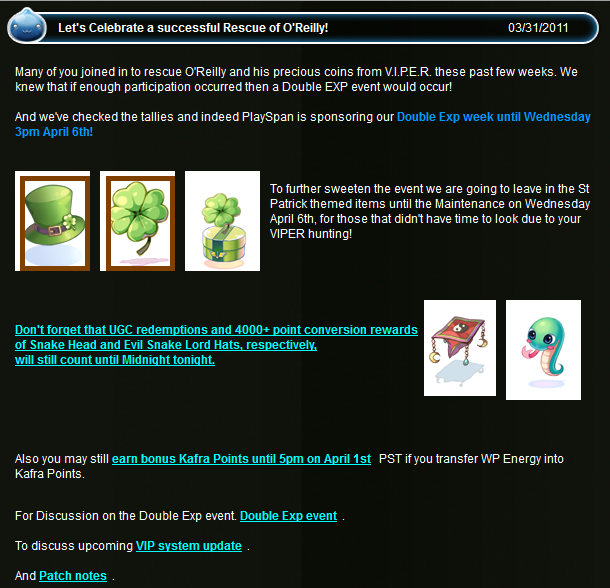 so what event is unlocked when enough green ales are donated? Last time this event was in, it was an EXP/DROP event. Can't find the exact info. As you've upvoted my post, I felt obliged to go and find the exact info. Does anyone ever worrry when killing all those Isis? I keep checking just in case one of them is Mia the Isis (http://irowiki.org/w...e_Littlest_Isis) as I don't want to kill her. Sure, she picked out a house in Comodo, but apparently her wanderlust is strong and she left her home there to wander around again. I hope she's doing well!